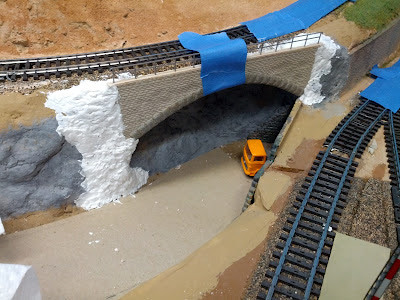 Tonight I glued the railing to the bridge. The railing is anchored in small holes I drilled into the stripwood that runs across the top. One hole went into my finger, but that's another story. Next I taped the bridge to the sub-roadbed and the track, applied a generous amount Scuptamold to build up the surrounding rock, and cement the bridge in place permanently. Next up: Painting the whole thing.